“LGBTQ+” stands for Lesbian, Gay, Bisexual, Transgender, Questioning (or Queer). Sexual orientation is about who you’re attracted to and want to have relationships with. Sexual orientations include gay, lesbian, straight, bisexual, and asexual. Gender identity is how you feel inside and how you express your gender through clothing, behavior, and personal appearance. It’s a feeling that begins very early in life. Learn more about gender and gender identity. HOW DO I KNOW IF I AM GAY (LGBTQ+)? The same way straight people know they are straight. Sexual Orientation is defined by who you are physically and emotionally attracted to within a romantic relationship. Learn more about understanding if you are gay. HOW CAN I GET ACCESS TO LGBTQ FRIENDLY SERVICES? There are several organizations in Los Angeles that offer LGBTQ youth friendly services and support groups. The LGBTQ Center, Penny Lane, AltaMed, Children’s Hospital Los Angeles, and LA Gender Center, are some organizations that offer youth-friendly services. I FEEL LIKE I’M ALL ALONE AND DON’T HAVE ANYONE THAT UNDERSTANDS. WHAT CAN I DO? If you are feeling lost and alone, please reach out to MY LGBT PLUS or to other support groups like The Trevor Project, PFLAG (Parents, Friends and Family of Lesbians and Gays), or Trans Lifeline. If you are in middle school or high school, your school may have a GSA (Gay Straight Alliance) or similar student group, where kids your age, including other LGBTQ kids, talk about their experiences and provider support to one another. Even if that club doesn’t have another student that you feel understands you, the club’s advisor may be able to provide that support or identify someone on campus who can be a support person for you. WHAT DOES IT MEAN TO COME OUT? Coming out refers to the process that people who are LGBTQ go through as they work to accept their sexual orientation or gender identity and share that identity openly with other people. Coming out is a very brave thing to do, and it’s extremely personal and different for everyone. Your emotions when coming out may range from scared and anxious to elated and relieved. Learn more about coming out here. CAN MY CAREGIVER (INCLUDES: FOSTER PARENT, GROUP PARENT, TRANSITIONAL HOUSING) KICK ME OUT BECAUSE I AM LGBTQ? No. You cannot get kicked out of your placement for being LGBTQ. If you feel like someone is kicking you out for that reason, talk to your lawyer. The Alliance for Children’s Rights and Public Counsel also have attorneys that can help you. I AM LGBTQ. IS MY RELATIONSHIP HEALTHY? 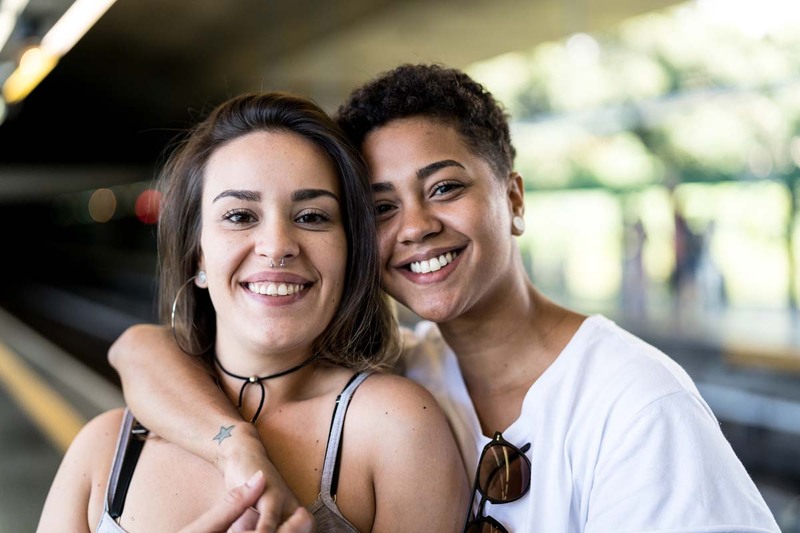 Healthy LGBTQ relationships are often characterized by how resilient, creative and unique they are. It can be hostile out there — why shouldn’t your relationship be a safe space where you’re free to be yourself? Learn about signs of a healthy relationship. I AM LGBTQ. HOW DO I KNOW IF I AM EXPERIENCING ABUSE IN MY RELATIONSHIP? If you’re LGBTQ, you can face unique obstacles to seeking help, especially when you’re first coming out. Know that you are not alone and there are places that can help. Learn about the obstacles you may experience and who to contact for help. *Thanks to the National Center for Lesbian Rights for providing their expertise in this area!